Remember when digital ads were the latest, greatest thing in retail marketing? Remember when you could create an AdWords campaign that simply said, “Buy from my store at 20 percent discount” and people would buy from you? Unfortunately, the days of enjoying those leverages are over. Today, consumers barely trust digital ads, so getting them to buy from your retail store is a lot complicated than it used to be. That said, forward-thinking brands are embracing new marketing approaches. A wave of findings about word-of-mouth recommendations and peer influence have given rise to retailers partnering with people who can sway buying decisions and product preferences. These retailers are experimenting with influencer marketing to see if it creates the type of impact that drives conversions. Instead of targeting consumers with digital advertisements, retailers have begun to work with influencers to create campaigns that interest people and push them toward a product purchase. According to a market study conducted by Fortune with eMarketer, traditional retailers are engaging with Snapchatters, Instagrammers, YouTubers, and bloggers to drive conversions for online retail marketing. 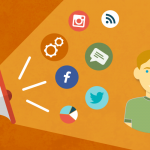 What is the impact of influencer marketing? 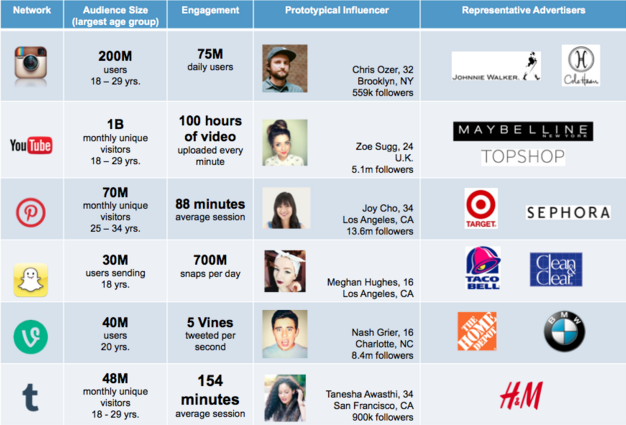 How does influencer marketing compare to other forms of marketing? A few years ago, Macala Wright talked about the “bastardization of influence”. She talked about the lack of transparency in the way influencer marketing is practiced. Her view is that just because someone has online popularity doesn’t necessarily equate them to being the best fit to represent your brand. She said quality needs to be the starting point, because quality delivers more value over quantity. The value of quality is sticky – it resonates with the audience your brand is speaking to. Wright also cited principal of The Altimeter Group, Solis. Solis said that brands don’t have to focus on top ranked bloggers, social media stars, etc. as they are not the only game in town. These influencers likely carry a hefty price tag when it comes to collaboration, which may not be within the budget of a small-to-medium sized retailer. 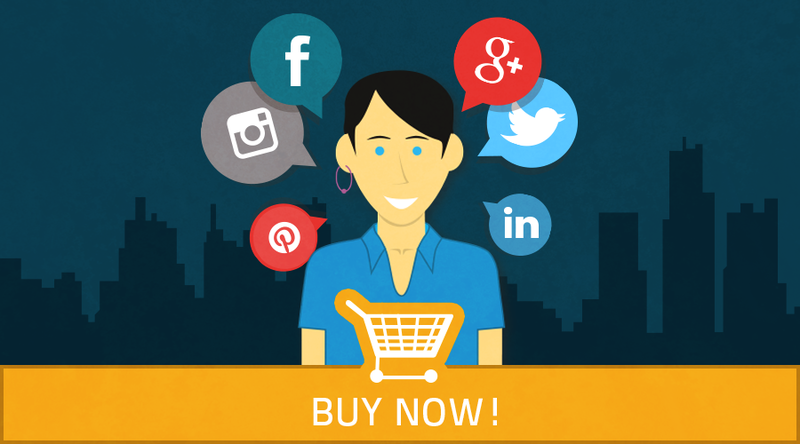 Therefore, retailers should focus on emerging, niche voices instead of top-tier influencers. The best influencer marketing campaigns will not only include people in new media, but also long-tail voices. These long-tail voices help carry information and promote discussions in a true peer-to-peer approach among customers. 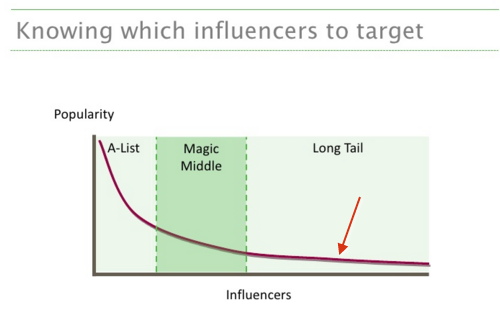 The typical long-tail influencer has less than 10,000 followers on social networks. With the right approach, you can build a good working relationship with them to promote authenticity at scale. But has long-tail influence worked out for retailers? The examples below hint that it is promising. Best Buy Canada collaborated with long-tail and mid-tier media and social influencers to promote its back-to-school campaign. The goal was to tackle the fact that parents are clueless about back-to-school shopping, and students are more informed than their parents about some of the gadgets. The campaign was aimed at helicopter parents folks perceived as too involved with their kids. The consumer electronics retailer wanted to increase social media reach while forming a direct relationship with helicopter parents. Best Buy invited influencers to a tour of Toronto in the Best Buy helicopter. The hashtag used for the campaign was “PermissionToHover”. While the campaign’s goal was to reach helicopter parents and show the edgier side of the brand, the retailer also wanted to be the go-to destination for back-to-school, which is the second busiest holiday in Canada next to the December holiday. 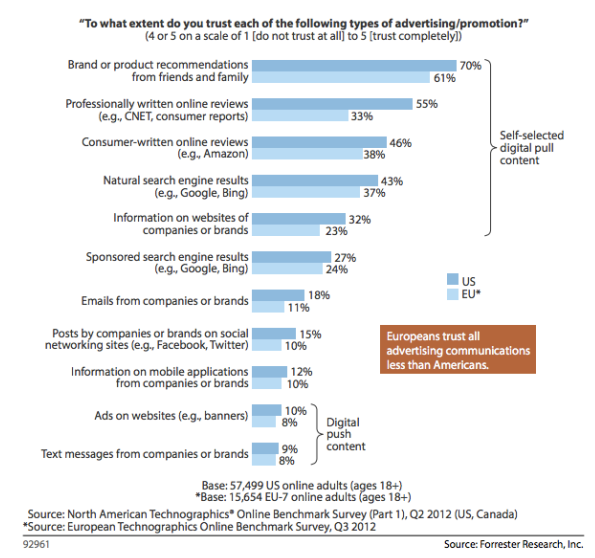 Most of the influencers attached to this campaign can be placed in the long-tail. 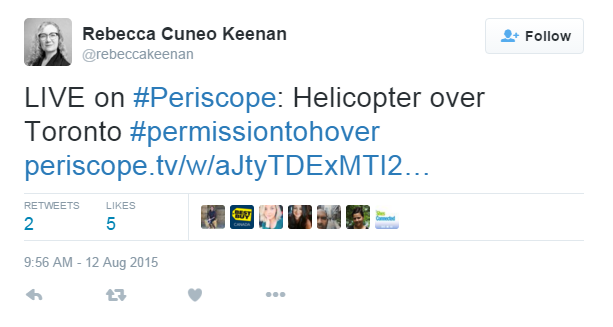 An example is Rebecca Cuneo Keenan, who has just under 3000 followers on Twitter. 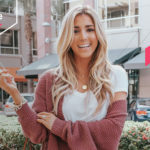 While the exact number of sales and organic reach resulting from this influencer marketing campaign is not available, comments made by people show it had a positive impact. Everyday influencers were also spreading the word about Best Buy deals using the hashtag. 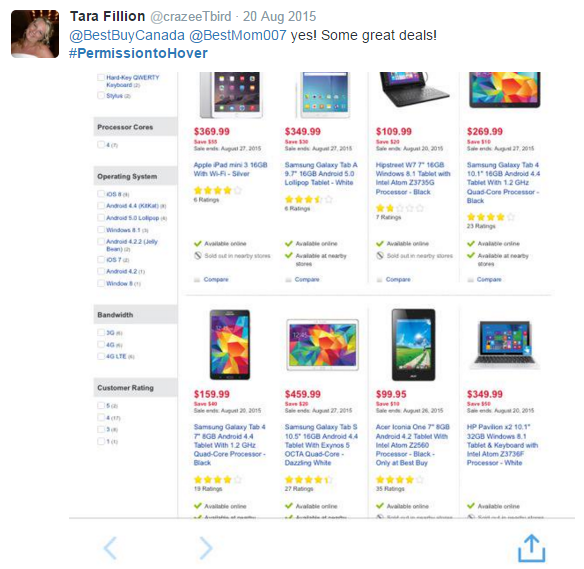 Overall, Best Buy Canada was able to generate a positive word-of-mouth on Twitter and other social channels. People were not A-list influencers, so their word-of-mouth likely had a great impact on their peers. The luxury goods department retailer tapped into the long-tail and magic middle of fashion bloggers as they often have a high degree of influence. It makes these individuals the ideal spokespeople for high-profile launches, events and marketing campaigns. Luxury Daily reported that Bergdorf Goodman collaborated with 5 fashion influencers from around the world to review their new line of sneakers in collaboration with New Balance. 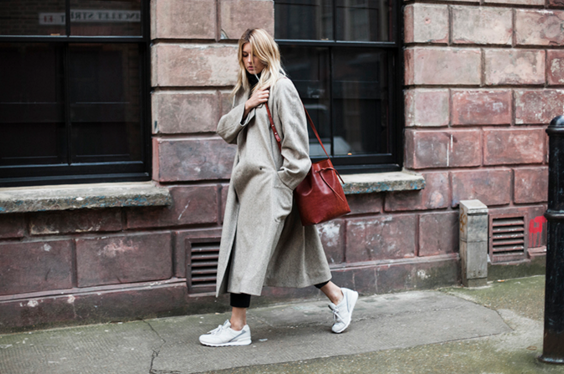 All influencers – Anh Sundstrom, Blair Eadie, Tamu McPherson, Jane Aldridge and Camille Charrire – wore different pairs of sneakers around New York City and wrote opinions on their blogs. 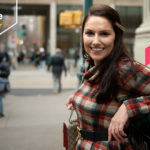 The diverse selection of bloggers allowed the brick-and-mortar to connect with different segments of consumers. 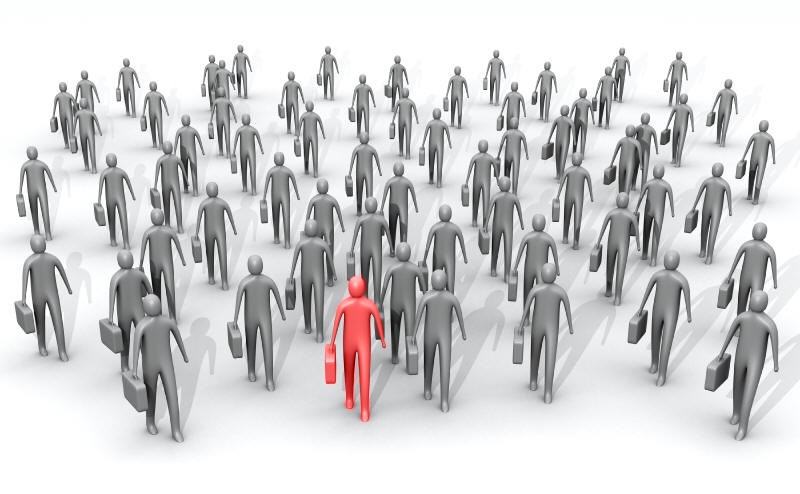 While each blogger didn’t have a massive following, they had a unique set of followers and decent influence on them. 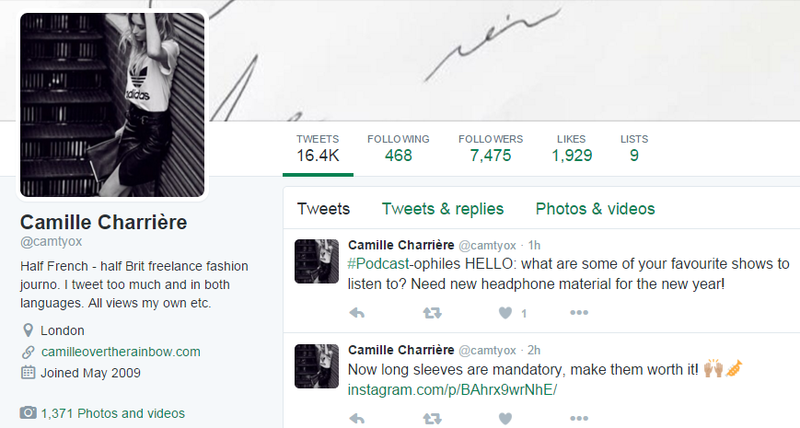 Camille CharriA?re, for instance, has under 10,000 followers on Twitter, and she just joined Instagram. One thing the brand did pretty well was showcase its store via influencers; this was done by inviting the girls at the store (where they celebrated the launch of the new sneaker collection) and doing a photoshoot. This enabled the brand to demonstrate a more accessible vibe and that they were working with real women as opposed to fashion designers or insiders. The campaign generated a lot of positive engagement. This was apparent in the comments people left on the blogs of the 5 influencers. 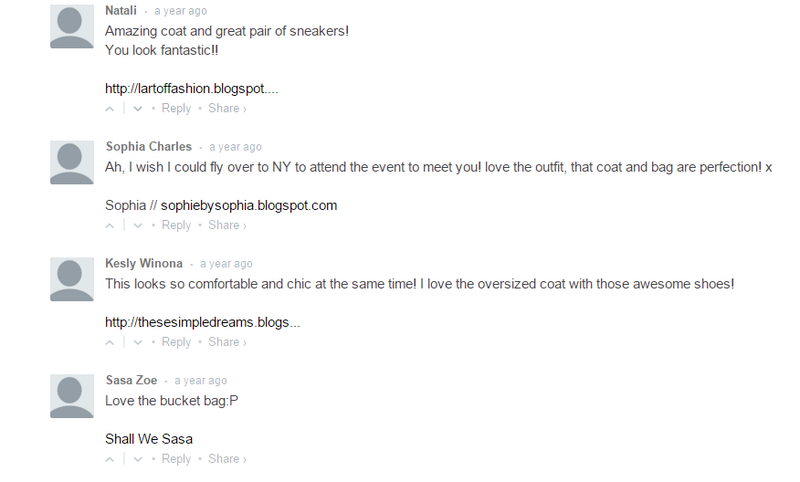 Here are some comments on the post created by Camille CharriA?re (pictured above). Search up the hashtag #BGxNB and you’ll know that consumers were highly influenced by the campaign. A fascinating thing to note is that other long-tail influencers (outside of the 5 invited) also spread the word about the line of sneakers. Note: The way the two retailers interacted with influencers is noticeable. Influencers were allowed to create personalized content without any interference from the retailer’s content marketing team or anyone else. In the first case, the retailer went up and personal with influencers by inviting them to the helicopter ride. The same kind of interaction happened in the second case, and the bloggers were also given an opportunity to test the product itself. Personal interaction and co-creation were the keys behind the success of these influencer marketing campaigns. The above mentioned examples show that influencers have the potential to reach thousands through their social influence and broad presence. Retailers in every vertical can no longer ignore these powerful individuals. A trusted voice speaking to their target audience is the most effective exposure a retailer can get. Also, by using the combination of influencer-generated content and user-generated content, retailers can create powerful campaigns that drive conversions. Because trust in peer recommendations is huge, influencers who can relate to consumers and advocate specifically by collaborating with the brand can win people’s trust. Create highly targeted campaigns: Even hyper-local targeting is possible. For instance, you can partner with influencers in the area where your store is located. Customers who come through these influencers are far more likely to be purchasing customers since your store is located nearby. Create brand loyalty: If you’re a new store, you won’t have loyal customers immediately. By collaborating with relevant influencers who have a deep relationship with their followers, your brand can build equity and trust with potential customers quicker. 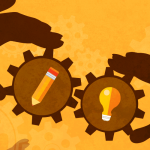 Create ROI reports: There are several metrics you can track to see where your ROI stands. You need to make a small investment first to identify influencers and then work with them to create a scalable campaign. Because this marketing approach doesn’t require substantial investment, you can track ROI at a low cost. 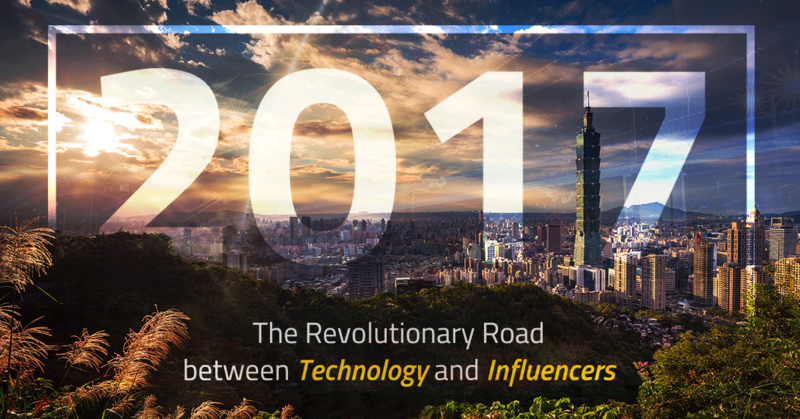 Influencer identification platforms are paving the way for marketing automation. 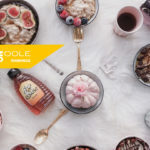 Buzzoole and other similar platforms can analyze your store’s branding and content marketing approach to generate a profile of influencers who can lead your campaigns effectively. 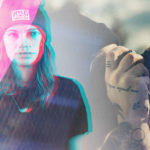 Via algorithms, influencer marketing platforms can connect you with the right individuals who infuse authenticity and transparency in your campaigns. Retailers can engage influencers by sending them relevant offers or by inviting them to their brick-and-mortar outlets. Going on Instagram, Pinterest, Facebook, etc. will enable you to see the interaction someone has with their followers. Numbers and likes should be the last two things you should consider; these are not as important as the influence of an individual over their followers. For instance, someone with 100 followers might be able to convince 80% of their followers to buy your product, while someone with 1000 followers may only convert 5% of their followers. You’d look at the influencer’s interaction with their followers, as someone with a small following could be better at convincing people. Hashtags are pretty important. 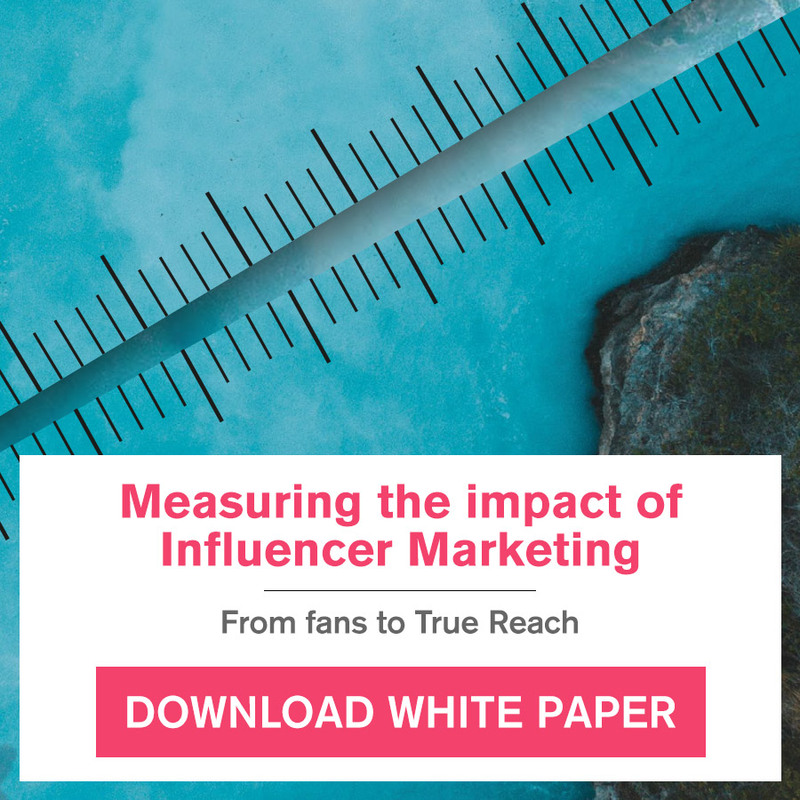 They can not only help you find influencers and create a list of possible options, but also demonstrate the impact an influencer has over their audience as we saw in the examples. With hashtags, yon can see which individuals are attracting eyeballs in your niche. Search a particular hashtag, and then search for similar terms to narrow down your influencer search. You can find experts for very specific niche areas. a positive image and relate to consumers on a general level. It skips the brand-centric approach by giving the power in the hands of someone who consumers look up to and expect transparency from. Other marketing methods rarely include individuals who can sway opinions. the results would be impactful and meaningful.